Competence center (CC) ROBOFLEX participated in one of the prominent central European industrial fairs for craft and entrepreneurship. 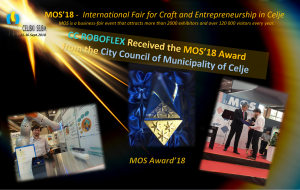 This fair is organized every year in September in Celje (Slovenia) – MOS’18 (11-16.September 2018). This year was the 51st fair with more than 2000 exhibitors and over 120.000 visitors from different countries. The CC ROBOFLEX was introduced by the CC’s core partner ETRA Ltd, which is responsible for the CC ROBOFLEX DEMO center and robotic systems integration. We presented the CC ROBOFLEX services, the network of regional and EU partners, and practical demonstration of the use of collaborative robot – in this case with the practical demo example by the use of KUKA IIWA robot.